True color image of galaxy NGC 1167, overlaid with contours depicting the spiral-like star-forming regions. Image courtesy Gomes et al. (2016). Using data from the SDSS1 and CALIFA2 surveys, a team3 of astronomers, led by Jean Michel Gomes and Polychronis Papaderos from the Instituto de Astrofisica e Ciencias do Espaco (IA4), in Portugal, discovered in the optical faint star-forming spiral-arm-like features in the periphery of nearby early-type galaxies5. This work6 was presented yesterday, during the 2nd SELGFIS Advanced School on Integral-Field Spectroscopic Data Analysis , ongoing in Madrid until the 25th of November 2016. Usually, star-forming regions are blue areas, HII-regions that house short-lived massive blue stars, embedded in the disk section of spiral galaxies. In contrast, Elliptical and Lenticular galaxies (historically referred to as early-type galaxies) are composed of old stars with reddish colors, and are thought to be "dead" spheroids, no longer giving birth to new stars. However, the CALIFA study led by the IA team has now discovered in the optical spiral features in the outskirts of three nearby early-type galaxies, which points to a still ongoing inside-out growth. This adds valuable observational insight into the origin and evolution of spiral structures in old spheroidal galaxies. 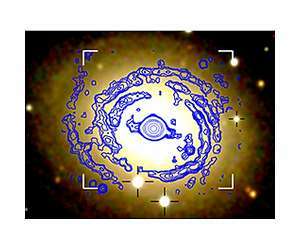 Jean Michel Gomes (IA and University of Porto), co-leader of the SELGIFS8 work package Reconstruction of the Star Formation History explains the novelty of this discovery: "According to our current view, grand design spiral-like features are associated with disc galaxies. "These are, in general, regions of enhanced star formation. We were surprised to have discovered, for the first time in the optical, spiral-like structures in early-type galaxies, which we believed to have stopped forming stars in the last few billion years and should entirely lack spiral features." The discovery of faint spiral-like star-forming features in the periphery of early-type galaxies in this pilot study by Gomes and Papaderos has already motivated a further investigation of this issue by researchers at IA. To Polychronis Papaderos (IA and University of Porto), founding member and Co-Investigator of SELGIFS and scientist in charge of its Portuguese node: "This study provides further observational evidence for a still ongoing growth of some seemingly "old and dead" early-type galaxies in the local Universe, out of a reservoir of cold gas that feeds low-level star-forming activity in their periphery". IA researchers Gomes and Papaderos, together with their PhD students Iris Breda and Sandra Reis, are leading a research within the CALIFA collaboration, on the properties of the diffusely distributed warm ionized gas in early-type galaxies. The main goal of this project is to evaluate the role of various possible gas excitation mechanisms in early-type galaxies.